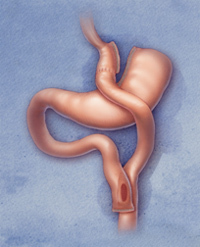 In the Gastric Bypass procedure, a small stomach pouch is created to restrict food intake. Next, a Y-shaped section of the small intestine is attached to the pouch to allow food to bypass the lower stomach, the duodenum (the first segment of the small intestine), and the first portion of the jejunum (the second segment of the small intestine). This bypass reduces the absorption of nutrients and thereby reduces the calorie intake. Dumping syndrome occurs only after gastric bypass and is a reaction of the body to a meal with a high amount of carbohydrates/sugar. When this meal goes from the stomach pouch to the small intestine, patients may experience multiple, very unpleasant symptoms: crampy abdominal pain, vomiting, diarrhea, cold sweats and severe weakness.